Meticulously Executed Outdoor Living with a View in Leander, TX! 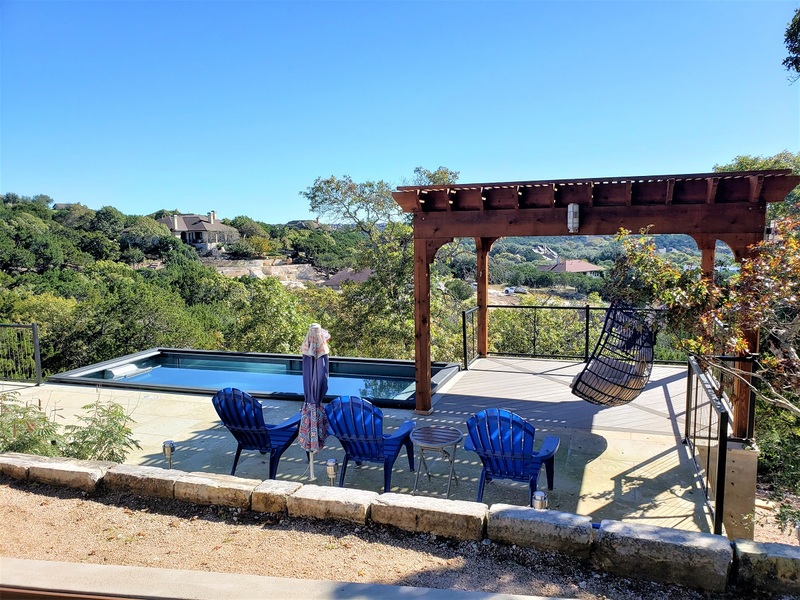 Oh, what a view it is – Hill Country living never looked so lovely! Archadeck of Austin is proud to have been a part of this thoughtfully planned outdoor living space, where no Whitestone was left unturned. The results are stunning! Trust us, we know exactly how you feel. We’ll give you a moment to pick your chin up off the floor. 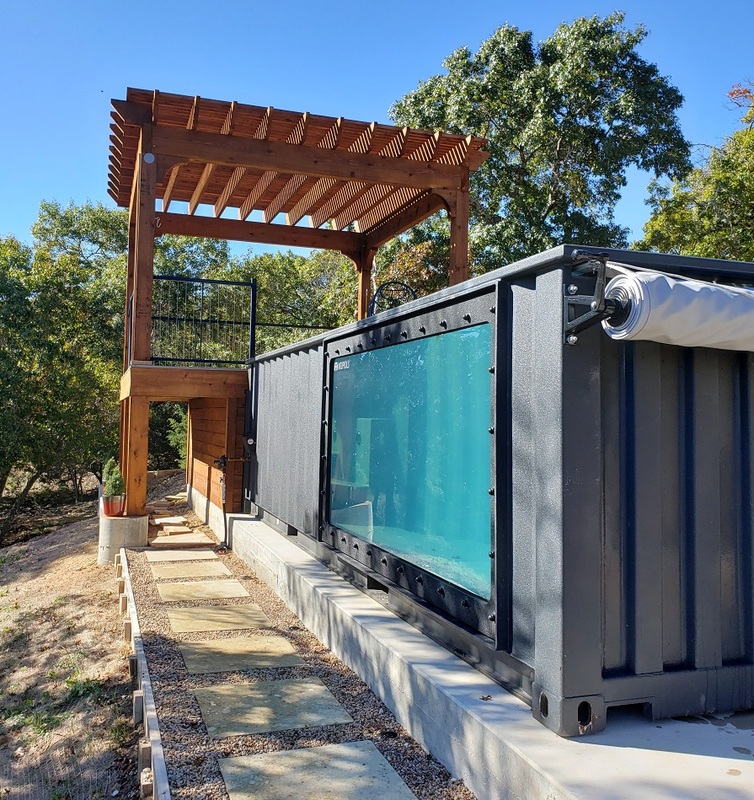 This is one pristine property in the Crystal Falls community, which is truly unique in that each phase has been met with professional design, gorgeous finishes, and one fantastic converted shipping container hillside pool. 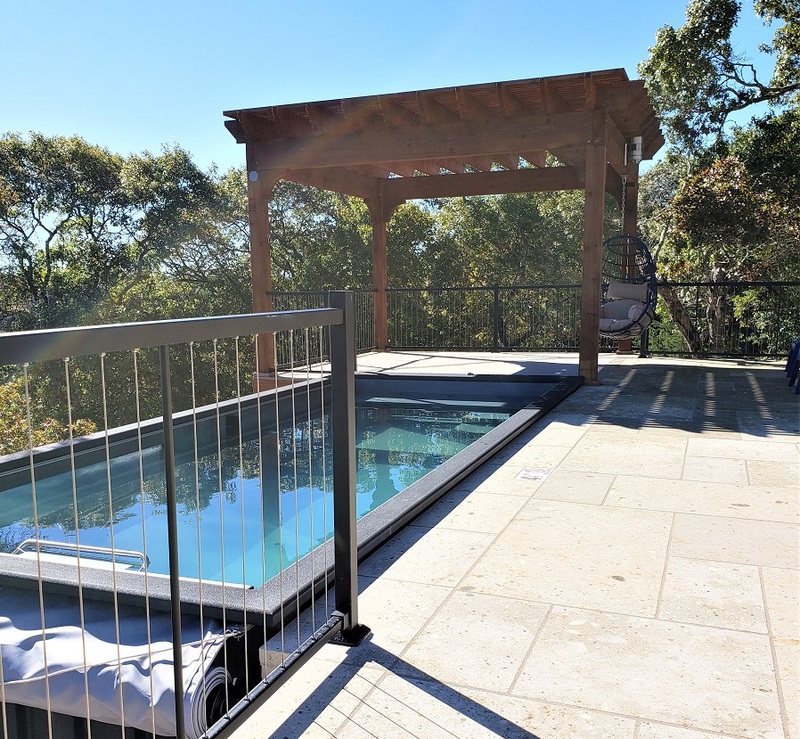 Archadeck of Austin was called upon to design and build a low-maintenance poolside deck and cedar pergola that is form and function in equal measure. This project was about creating a beautiful outdoor living design that didn’t detract from the natural beauty, or the existing masonry finishes. — Low-maintenance AZEK pool deck and pergola in Leander, TX. 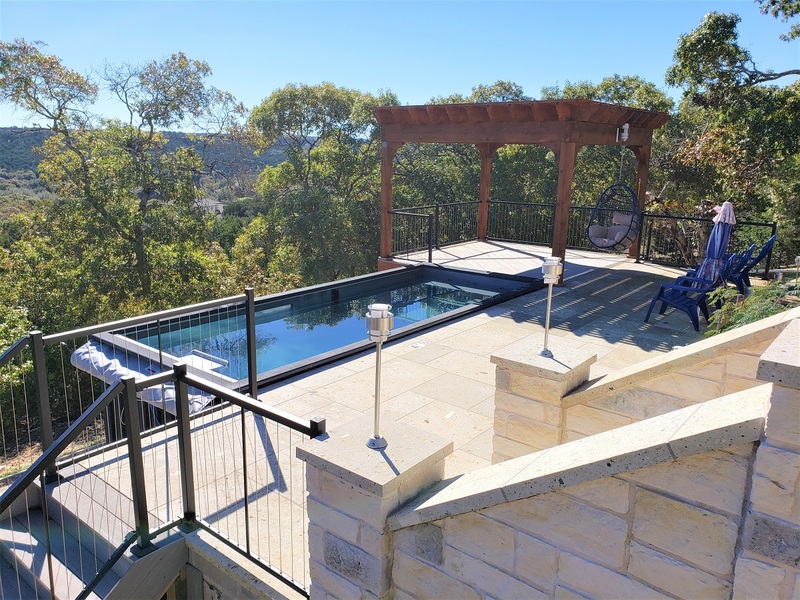 The hillside landscape in Crystal Falls sets an unbelievable stage for a pool deck. Archadeck of Austin designed a low-maintenance deck befitting the homeowners’ design and outdoor living requirements. The deck was built with AZEK Coastline tongue and groove porch system. Coastline is a timeless light gray finish that is in perfect color harmony with the existing masonry. The tongue and groove design of the boards provides a tight installation, and these capped polymer porch boards will stand up to a very exposed hillside climate. Harsh sunlight is no problem for this deck! — Low-maintenance deck and custom cedar pergola in Crystal Falls. 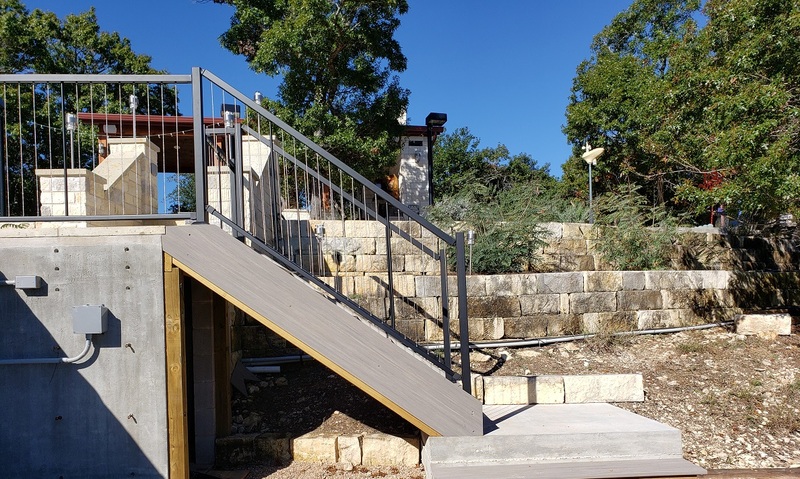 Click to see more low-maintenance composite decks by Archadeck of Austin! Not only will the light gray finish provide heat dissipation, but the custom cedar pergola further facilitates a cool walking surface by providing partial sun protection over the area. Adding to the thoughtful design, we provided a service area panel, where the homeowners can access the electrical controls of the swim spa below the deck. Click to see more pergola designs by Archadeck of Austin! When you have a sweeping view like these Crystal Falls homeowners, one thing is for sure – you do not want to obstruct it on any level. We installed a Fortress vertical cable railing system with a low-profile aluminum frame. Cable railings are perfect in any outdoor area, where protection is required, but inconspicuousness is an absolute must. The black aluminum frame is a perfect choice, as the eye is not drawn to it, but beyond it. And it’s sleek and stylish to boot! — Fortress Railing vertical cable railing in Leander, TX. The steps leading to the ground level are pressure treated wood framing with matching AZEK stair treads and fascia board. — AZEK stair treads and fascia board. 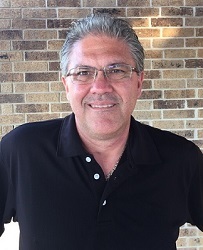 When it comes to designing a truly custom outdoor living area, Archadeck of Austin is armed with professional designers and top-notch outdoor living finish materials to best suit your design tastes and desired maintenance level. As an outdoor living design-build firm, we will bring your dream outdoor living space to life, just like we did for these Crystal Falls homeowners. If you are looking for an outdoor living space that will add beauty and function, but take nothing away from your view, call Archadeck of Austin today at 512-259-8282 or email us to schedule your free design consultation.